Slush drinks aren't just for kids any more. There's been an explosion of interest in frozen cocktails and alcoholic slush drinks among adults who want to kick back and relax with an icy treat. 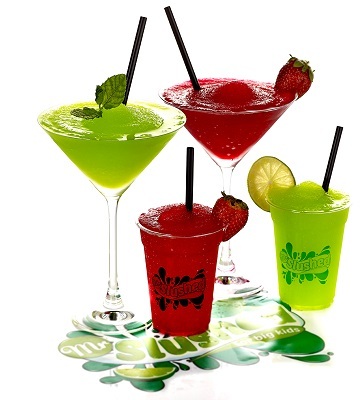 Eight great flavours: Mojito, Pina Colada, Energy Slush, Margarita, Strawberry Daiquiri, Lime Daiquiri, Champagne and Lager & Lime. Neutral Base Slush Syrup is also available should you wish to create your own cocktail flavours. Mix one part Mr Slushed syrup with one part alcohol and four parts water for delicious frozen cocktails. Fully frozen cocktails in less than an hour. We are committed to quality, use of premium ingredients and exemplary customer care. We'd love to introduce you to Mr Slushed frozen cocktail syrups. Place an order online now, or give us a call with any questions or queries. Mr Slushed Cocktails There are 8 products.